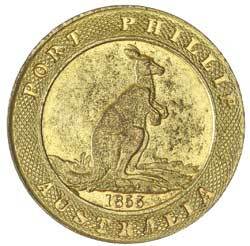 PORT PHILLIP, Kangaroo Office, one ounce restrike in gilt white metal, struck c1917 by Stokes, plain edge (10.92g). Considerable rust evident in the dies, otherwise extremely fine and extremely rare. 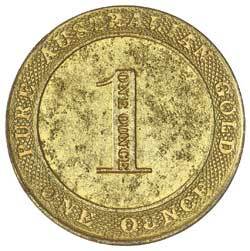 Ex Noble Numismatics Sale 100 (lot 1312).